The making of wooden barrels, or cooperage, was once a highly respected craft in Dublin city. Guinness alone employed hundreds of coopers to make and maintain the oak casks that carried the famous stout far and wide. 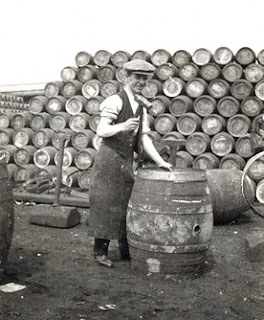 Sadly, in the 1960s, a long tradition ended when metal casks displaced the older variety. The various Dublin distilleries maintained substantial coopering departments too but whiskey production ceased completely in Dublin during the 1970s. My grandfather (Mr Edward J. O'Reilly, pictured below) was employed as a cooper in Guinness and his father at the John's Lane distillery where Power's Whiskey was made. Coopering was a family business and carefully protected as such by the Coopers' Guild. I have published some archive material on this site related to this historic guild. The Rules of the Society give some flavour of how a guild operated, how much control it exerted over the profession and how apprentices were inducted into the trade. The minutes of the final meeting of the Coopers' Guild in 1983 mark the end of an era for Dublin craft and industry.